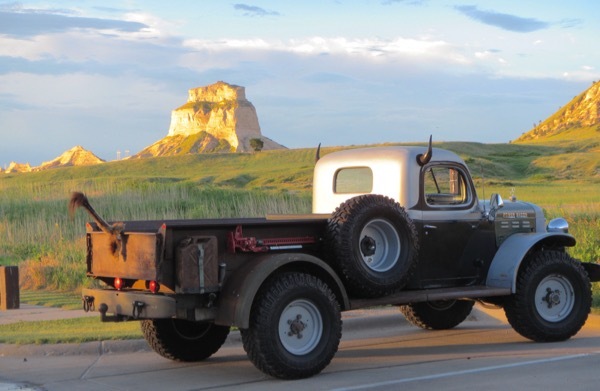 Bugman and I got up early on Saturday morning and headed to Scotts Bluff National Monument to help out with the 2015 Oregon Trail Days Bicycle Hill Climb. As usual, the scenery was divine in the early morning light. There was also this interesting addition to the backdrop of the bluffs. I thought the truck was destined for the OTD parade later that morning, but I didn’t see it. I guess this is just someone’s car??? 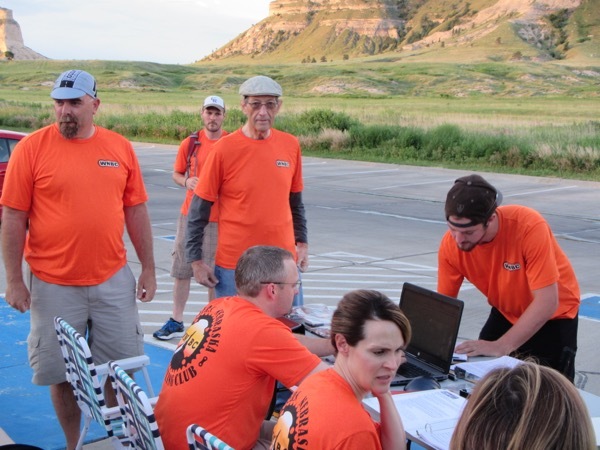 This was the first year that members of the Western Nebraska Bicycling Club were organizing the event, having taken it over from previous volunteers. Those orange WNBC shirts really stand out! 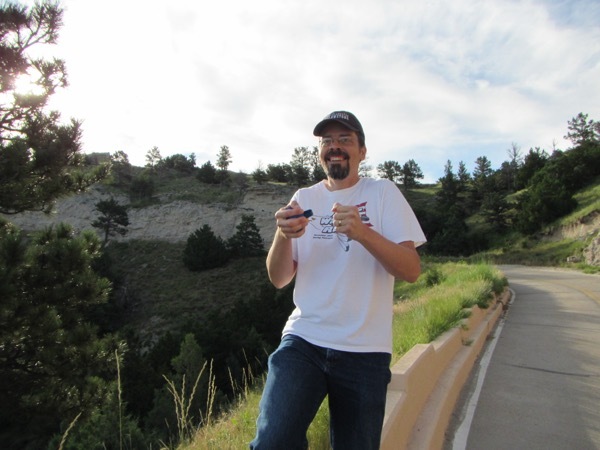 I also have to give props to the staff members at Scotts Bluff National Monument – they were so wonderfully helpful. 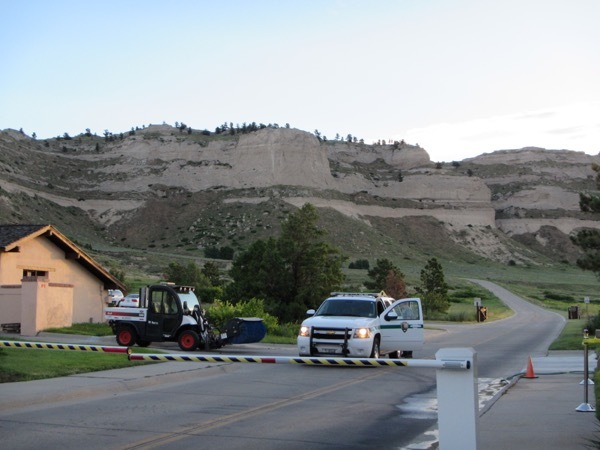 They arrived extra-early to make sure the road would be safe for the bikers and took a sweeper up to clear off a bit of rock that had crumbled onto the road overnight. 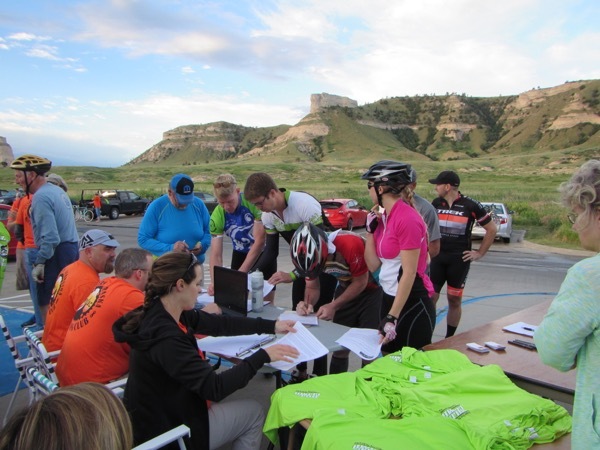 I was glad to see some out-of-area cyclists signing up in addition to the locals. Bugman and I were assigned to the cheering section for the hill climb, as previously people have commented that the race course was kind of quiet. We were offered a couple of cowbells to cheer with. I was a little dubious about this, as I considered it a bit early in the morning for cowbell, and it almost seemed sacrilegious to shatter the early stillness of the bluffs with all that clanging. At least some of the riders later said they appreciated it, though. After the first few riders, we settled on a cowbell rhythm, which seemed much more tolerable than random clanging. Bugman is also a percussionist (he’s played drums in a few orchestras, garage bands, and big bands), so rhythm comes naturally to him. I just followed his lead. Crowd favorite and perennial Hill Climb participant Joe Lichius, 74, won his category with a time of 25:33. Results for the 2015 event are here. 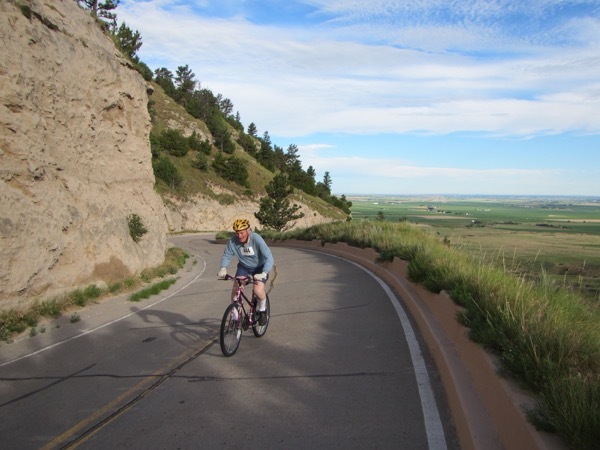 This hill climb is definitely a challenge (I heard a lot of “sprinter’s hack” after the event), but you can’t beat the scenery, and the camaraderie is pretty great, too. We were glad to be a part of it again this year on the volunteer side.